So the latest news with me is that I joined my church's hockey league, and I'm helping teach and organize the league. Its been at least three years since I've last played. I used to do floor hockey at my home church in Victoria as well for a couple years. The current league plays on a tennis court which one of the families of the church privately owns. We practice twice a week, and we play a game every Saturday. We're one week away from the team captains drafting their teams. I've been busy training noobies in the fundamentals of hockey. I'd like to give a special thanks to Doug and Adam from North Douglas Church, who taught me everything about floor hockey. Two weeks ago, I picked up all my hockey gear. I've got shin guards, knee pads, elbow pads, and a nice light composite hockey stick. I'm really digging this hockey stick though, it's pretty stiff and responsive. The light weight of the stick allows me to get off shots quicker. I'm also hoping it lasts longer than a wooden stick. The position I seem to do well right now is the offensive defencemen role. My defense has been described as "squirrly" and "clean". We'll see where the team captain puts me on the team though. All players assemble at the center for prayer. Singing of the Canadian National Anthem. Singing of the American National Anthem. League Commissioner will declare the beginning of hostilities. Game begins. 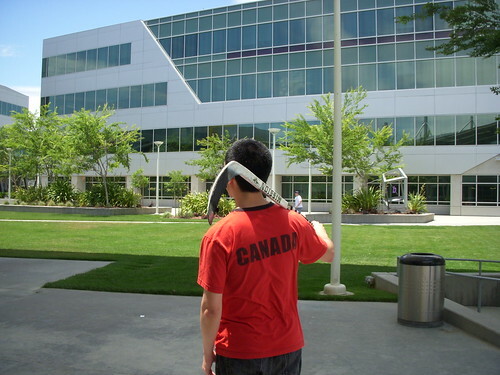 They've put up an American flag on the hockey court, so I'm countering by bringing in a Canadian flag today. It's also cool that there's another Canadian playing in the league as well. In either case, I'm off to a hockey scrimmage to represent the good folks of Canada. Couple weeks ago, I had to pleasure of attending Yahoo! Labs' Big Thinkers Series, featuring Dr. Lawrence Lessig. His talk was entitled, "Innovation Corruption," aka what is wrong with Congress. “The vast majority of Americans believes that money buys results,” said Lessig. Because of money in the system, Americans have become cynical. They’ve disengaged, and the country’s democracy has become less responsive and more corrupt. Why is our Internet speeds slower than the rest of the world? Why did we bailout Wall Street in the financial crisis? And there's much much more. I thoroughly enjoyed the talk.